MLC Walt Secord has described the Police Remembrance Service held recently at Sydney’s The Central Synagogue to the NSW State Parliament. Secord told the House: “On Friday 28 September 2012 I attended an historic Shabbat service at Central Synagogue at Bondi in Sydney’s east. It is historic because it is the first non-Christian service in New South Wales to mark National Police Remembrance Day. This remembrance honoring police officers who lost their lives in the line of duty is observed on the feast day for St Michael the Archangel, the patron saint of police. Police Remembrance Day was first held on 29 September 1989. 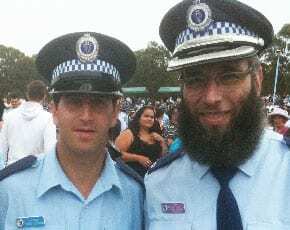 However, this year a Jewish service was added to ceremonies by Rabbi Mendel Kastel, the Jewish chaplain for the NSW Police Force. I have had the pleasure of knowing Rabbi Kastel since the late 1980s when he first came from New York City to be trained and ordained at the Yeshiva Gedola Rabbinical College in Bondi. Over the years, Rabbi Kastel has also served as a rabbi, cantor and community leader in a range of different locations throughout the United States, the United Kingdom, Russia, New Zealand and, finally, Australia. He is now the executive director of the Jewish House, a crisis centre established by the Yeshiva in Bondi. Rabbi Kastel has six children and a lovely wife, Tzippy. He is also a person with a deep commitment to chaplaincy and pastoral work. In Judaism, visiting the sick and caring for and consoling the ill is more than a good deed. It is a positive religious commandment or mitzvah, making it an obligation on all members of the faith. Accordingly, as Rabbi Kastel told me recently, he has been visiting the sick in hospitals since he was a teenager. It is no wonder then that he has now found the energy to extend this obligation to those in the police community who deeply deserve our respect and care. The New South Wales Police Remembrance Day Jewish service started at 5.30 p.m. It flowed into the regular Shabbat service conducted by the Central Synagogue’s spiritual leader, Rabbi Levi Wolff. A number of police officers from various commands, including the Eastern Beaches Police Commander, Superintendent Gavin Dengate, and the Parramatta Commander, Tony Trichter, attended the service. There were Jewish police officers there, as well as families showing their support and respect for our police and their sacrifice. Local political leaders included Waverley Mayor Sally Betts and Deputy Mayor Tony Kay and newly elected Randwick Councillor Pat Garcia. As an aside, Councillor Garcia is a friend and a former colleague who served as Premier Kristina Keneally’s director of policy throughout her premiership. I believe he will make an excellent representative of the Randwick community. I attended as a long-time supporter of the Jewish community and in my capacity as the deputy chair of the New South Wales Parliamentary Friends of Israel. I was honoured to be asked to recite a prayer in the synagogue—not only honoured due to my long support of the New South Wales Jewish community, but equally honoured to help commemorate the bravery and selflessness of our police officers. As I have said in this Chamber before, police officers make incredible sacrifices and do so for our sake. As a society, indeed as law makers, we ask them to stand between civility and harm. We ask them to stand where I think most of us would admit we cannot. It is an incredible request and, incredibly, thousands of officers embrace it each day. That is heroism. Heroism is not just in the bravery of a deed but in the motive. Tragically, there are days when that bravery comes at an ultimate price. On 6 March in the New South Wales Parliament I spoke as Labor’s duty member for Tamworth on the tragic death of Senior Constable David Rixon. At Central Synagogue’s police remembrance service, New South Wales Deputy Police Commissioner Nick Kaldas spoke beautifully about this same officer. Senior Constable David Rixon was the 251st police officer in New South Wales to lay down their life in the line of duty. Finally, amid the sadness, there was optimism. The Central Synagogue choir singing Waltzing Matilda in Hebrew not only was uplifting but also captured the very spirit of this event—to give thanks for the freedom and diversity of New South Wales society and to acknowledge the men and women who daily protect that very society. I congratulate Rabbi Kastel on organising the police remembrance service. Rabbi Kastel has since called me to suggest he will try to make it an annual event. I sincerely hope he does.